Even though last week was sunny and hot - dare I say - the cool nights and a whole day of rain a fortnight ago have signalled the shift from Summer to Autumn. You can see how dry it still is by the pasture in the background. The tomato plants got pulled out making way for Winter green manure crops. Applying Biodynamic prep “combined 500” to a green manure crop. This preparation helps to proliferate soil life, building the relationships between the diverse world beneath the soil and the plant roots. The compost piles steaming as Peter turns them. Autumn is our main season for building compost piles as the earth is still warm and the moisture levels in the piles is easier to maintain. Autumn is our season for renewal - sowing green manure crops and building compost piles as we remove summer crops. With most of this growing seasons crops in the ground, there is more time in the week for weeding in the orchard and preparing whole areas for winter green manure crops. Our harvesting continues with the broccoli taking over for cucumbers and cauliflowers for tomatoes. The carrots and parsnips sweeten with the cool nights. And English spinach has returned! A randomly selected CSA box from week 20 of our CSA season - week 3 of our late Summer/Early Autumn share. 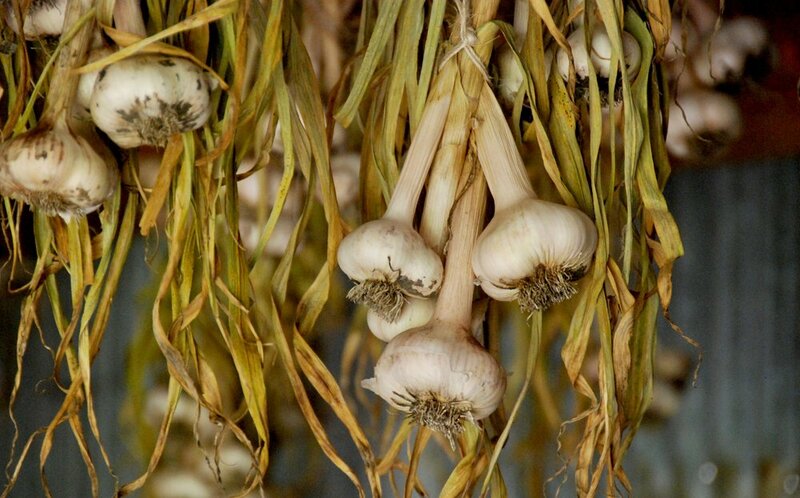 This year, we broke our CSA program into smaller seasons - on the request of our members. And it has been successful with each season quickly selling out! The Late Autumn/Early Winter share is now available for purchase in our on-line farm store. You can view weekly photos of the shares in this facebook album, have an idea of what food we are growing each month here, and/or read more about our CSA program here. This is the last six weeks of our CSA for this growing season. 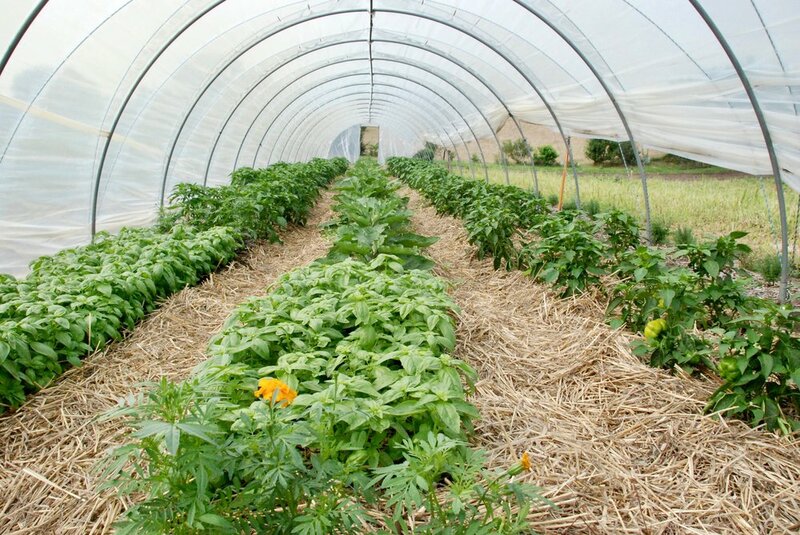 For those of you wondering about the differences between biodynamic and organic farm management and the impact conventionally grown food is having on our planet, this is an excellent article!! It highlights the superior quality of biodynamic food, how soils on biodynamically managed farms contain higher carbon contents to even those managed organically, the myriad of harmful ways conventional agriculture is impacting our earth and small steps you can make in your own gardens to join the regenerative agriculture movement! And with more rain falling, and heavy dew at night, Autumn is a wonderful time to plant more trees!! With the dry season we have had, we have lost many established trees in the native corridors and bush land surrounding our vegetable fields and orchard. We will be replanting in the weeks to come, continuing to increase the biodiversity of our farm. Scientist can use your help too! They are questioning and recording Australian trees dying during times of drought. Please read this article to see if you can help - As they state, “Many scientists, including ourselves, are now trying to identify the circumstances under which we may see trees die from climate stress. “ They are putting out a call for more eyes and observations. Our first year of actively saving seeds has been a success! And while we have a lot to learn about more time efficient systems for cleaning the seed, we are excited to be securing our food crops with localised seed that has the genetics to thrive in our heightened organic growing conditions. Each season we are being challenged with new insects and more extreme weather conditions. Localising our seed and building its genetics to include how to network in order to boost its own immunity and resilience are powerful tools for food security. Our pace has slowed but our list of things to do before Winter is long- with that said, we love Autumn as it feels like she is the beginning of our soil building for the following growing season. Hope you are feeling this rejuvenating energy too! Food for our community, food for the larger community, seed crops and special wedding posies. A CSA share from Week 15 of our 2018-2019 season. We try and meditate on patience for sweet Autumn knowing that when she comes the earth will move into her yearly time for renewal. Robin wrote an essay published in Issue 58 of DUMBO FEATHER - Healing the Land. Part poetry, part stream of consciousness, it takes you from the community deep in the soil, to the seed splitting, the flowers bursting, the sun parching, the rain falling, and the flow of water out into the oceans. Hope you, like us, are busy preserving the harvest and enjoying summers stretch..
…in all shades and colours!!! Pumpkins flower, are pollinated and grow! New varieties of beetroot are grown and sent to restaurants. Heirloom lettuce form heads and climbing cucumbers enjoy the shade created under a canopy. Sunflowers in the green manure bud while flowers in the tomatoes and hedgerows bloom. These green manures our our next crops food. Soon they will be mowed and incorporated, the soil life with transform them into stable humus which holds carbon and feeds the crop! Working within the natural cycle is amazing. 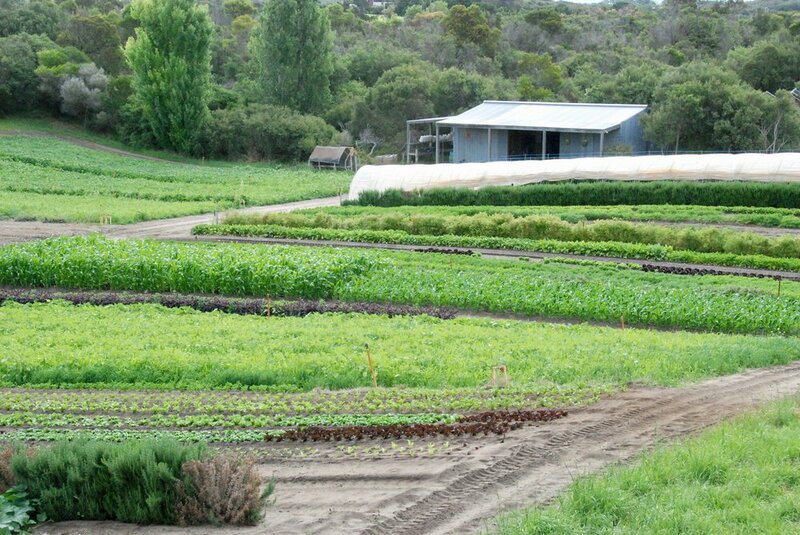 The farm is a rotating tapestry of green manure crops growing, soil prepared, and food crops at all stages of maturity. Language barriers are overcome as Robin gives a group of Japanese farmers interested in organic farming techniques a handful of soil to smell, taste and touch. and cap honey in comb filled with old pollen stores. Spring has charged along -with the days lengthening, grass growing, summer crops being sown, transplanted and taking off, lush lettuce, sweet peas, juicy radishes, tomatoes ripening, potatoes flowering, and plenty of planting- bringing us to the edge of Summer solstice. The season has had it all - cold nights, strong winds, hot days, and deluge rain. Through all of the extremes, and the beautiful days in between, most of our crops are showing resilience and vibrancy - signs of good health. We have broken our CSA into smaller seasons this year - with the January share being for the four Fridays in January (4, 11, 18 and 25). There are weekly or fortnightly shares available. To learn more or join, go to our online farm store. If you are curious what the shares this spring have looked like, please look at these photos or these photos from shares last CSA season. 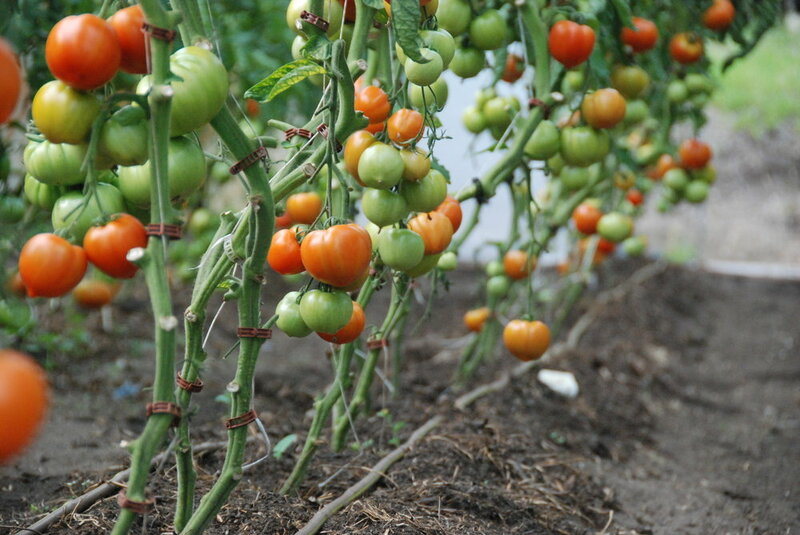 The January share will be followed by a mid-summer share which we hope will be at the height of the tomato harvest. We will be harvesting for our CSA through June. After taking a break last season from our CSA, we happily began harvesting produce for our community with our boxes beginning again in mid November. We also continued our growing for restaurants, including variety test trials - sending chefs a collection of varieties of butter lettuces, gem lettuces and sugar loaf cabbages thus far and asking them to judge the appearance, usability and flavour of the different varieties tasting them in three ways such as raw, with an acidic dressing and salt and with a touch of heat. 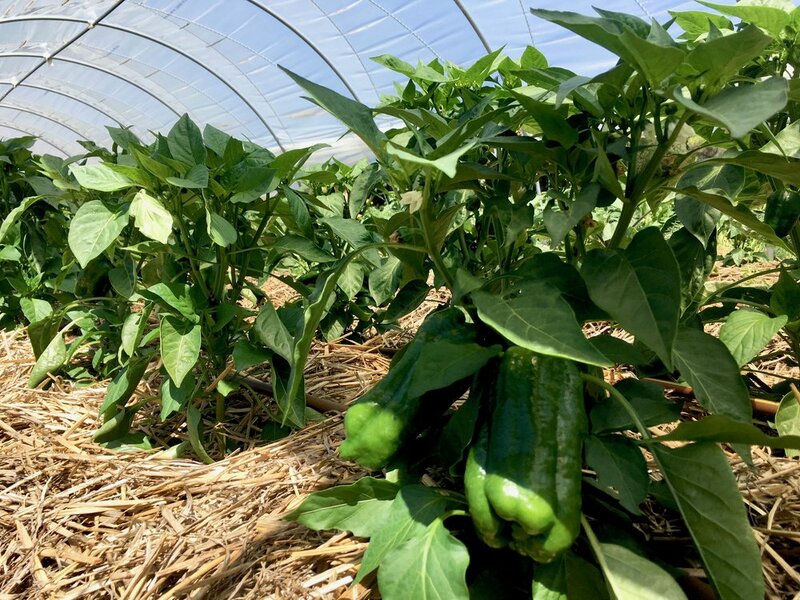 The results have been so interesting for us and the chefs and have guided which crops we are growing for both them and our CSA members as well as which crops we have put into seed production. And Spring has been filled with insects, which is quite normal. There is always a flush of aphids in early Spring. Hungry for the fresh new growth, their numbers breed ahead of the beneficial insects which arise and flourish restoring the balance on the farm. It is so wonderful to trust in the ecosystem that we have nurtured, knowing that the beneficials will see and eat the pests sooner and with more zest then we will!!! Our biodynamic practices continue to deepen through teaching on the farm and communicating more with other farmers. Each season our green manure crops diversify, supporting a larger range of soil microbes and helping us grow soil on this sand dune. As our plants feed only from our humus layer, understanding how to actually create soil filled with life is our most important work. In the past week, we have checked all of our bee colonies. Our bees reside in bee- friendly Warre hives which allow the bees to build their own comb, living in a "wild" manner. The central ethos of Natural Beekeeping is that it provides for the needs of the bee above that of the beekeeper. We ensure a 12 month supply of nectar and pollen by mapping the flowering plants on our farm and surrounding it, and filling in any gaps through species diversification. We believe that careful attention to the health and well-being of our bees, not only keeps the colony thriving, it also greatly improves the quality and purity of the honey. As we continue into summer, enjoying the amazing reverie of the earth’s exhale - even while we try and keep up with the busy farming schedule, we hope that the light of the season fills your homes and hearts and shines throughout the New Year! Its Spring! The fruit trees are flowering, the winter green manure crops are being incorporated, the glass house is full of seedlings, radishes are popping out of the ground, the bees are busy! Our biodynamic practices have continued and feel further enriched as we connect with more bd farmers. Having traveled to farms in North America this June and July, we realise that our practice of building humus to feed the “cash” crops as opposed to using organic/synthetic fertilisers is not frequently done. Our principles of nurturing our whole farm ecosystem, using flowering hedgerows throughout our growing space and making soil health a priority all support the vibrant diversity of life on the farm - Healthy soil leads to healthy plants, animals and people. After taking a break last Season, we are happy to be growing crops for our CSA again - the harvest will begin in November! We will be growing a smaller number of weekly/fortnightly boxes this time around and we have put those for sale on our website. We have split our seasonal blocks up into shorter commitments - to try and work in with School Terms, Christmas Holidays etc - our first 6 week box season will start Friday 16th November and run through until Friday 21st December. 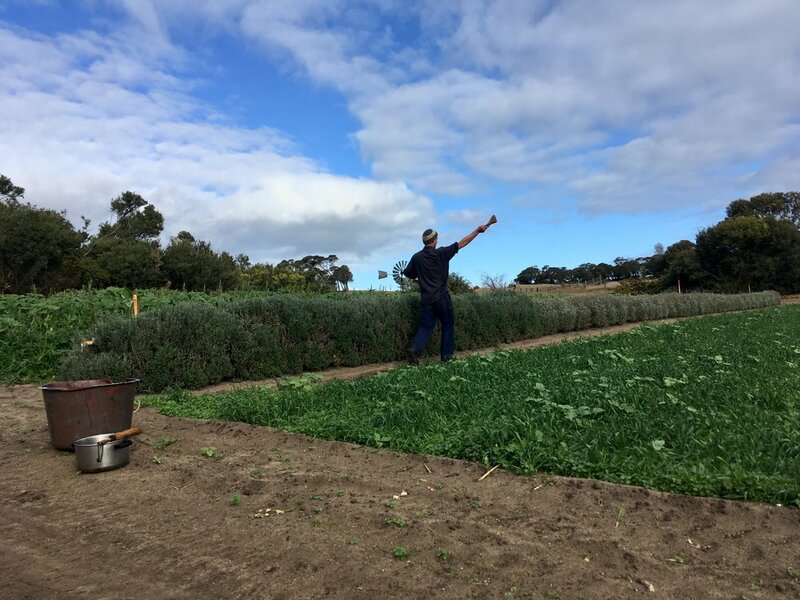 If you would like to get a box for this 6 week season please purchase it via our website at http://www.transitionfarm.com/farm-store/ - you have the option of a weekly or fortnightly box. All boxes are available by Farm Pick Up only and the Farm Pick Up Hours are Friday 10am to 6pm. This season, we will also be growing to order for four restaurants - collaboration with these chefs is exciting and offers us a different perspective of our produce. We will be running variety trials this season - “blind” tastings of different varieties of carrots for example and asking chefs to fill out a questionnaire about the taste and texture of each variety. It is a wonderful opportunity for them to experience different flavours - and it helps us as farmers to have further information about the flavour and usability of certain varieties as we pursue the art of seed saving and selective breeding. We are growing several new onions, lettuces, carrots, capsicums, cucumbers, pumpkins and beetroots which we will be trialing in the field and on the plate. Many of these varieties will also be in our CSA shares. The majority of growers, large and small scale, use hybrid varieties. Plant breeders are offering growers disease resistance, heavier yields, crops which “travel” and, in the case of supermarkets, lettuces which do not rust when cut. And while these are all great traits and/or advances in plant breeding, we have found that many of these hybrids have less flavour. We are pursuing farmer led breeding - choosing varieties which have great flavour and texture and then selectively breeding other traits we need as market growers such as disease resilience, hardiness through unusual climate events (such as 5 straight days of 40C+ temperatures) and high yield. We are trying to produce seed that can rival a hybrid making it worth the space in a market garden. This is a new endeavour for us and we are excited about how it furthers our goal of local food security. This season, we are growing 45 different varieties of heirloom tomatoes. And we are also growing heirloom/open pollinated lettuces, onions, celeriac, cabbages, capsicums, cucumbers, zucchini, squash, pumpkins, radish, turnips, eggplant…the list goes on! With all that, we also do trial hybrids as we have found some great ones which preserve flavour even while offering the other benefits. We believe in flavour and strive to offer our CSA members and restaurants produce with beautiful colours, textures and tastes. 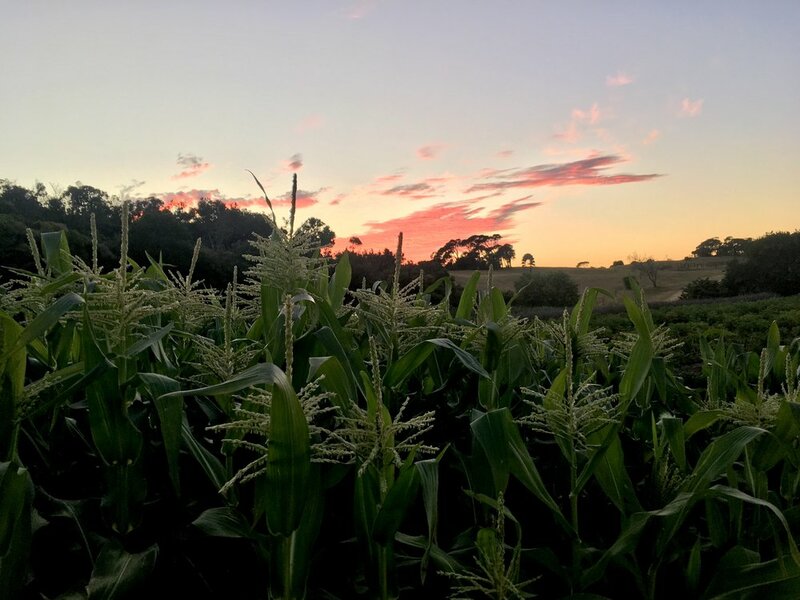 We wrote a post last Autumn and then never sent it…If you are interested in our “time off” musings, you can read them here… http://www.transitionfarm.com/seasonal-notes/transition-farm-autumn-2018. And as we are in the season of wildflowers…our six Warre bee colonies are prospering, having survived Winter very well! 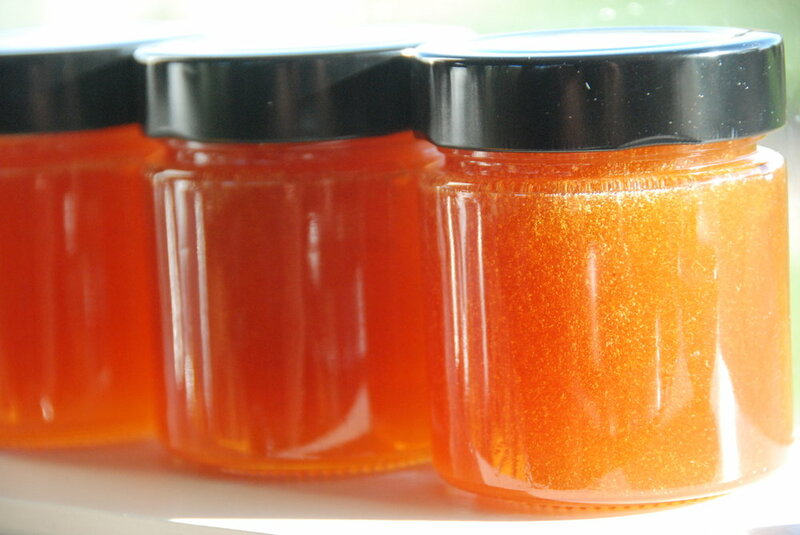 We continue to find them a source of interest and their honey is outstanding! The Warre hives are managed so that the bees are constantly renewing their wax and the honey that we harvest (when there is excess that the colony does not need) is filled with fermented pollen. This will be available at farm pick up to our CSA members. We are so lucky to live in an area where our major nectar flow is leptospermum…manuka honey - It’s healing qualities are amazing! 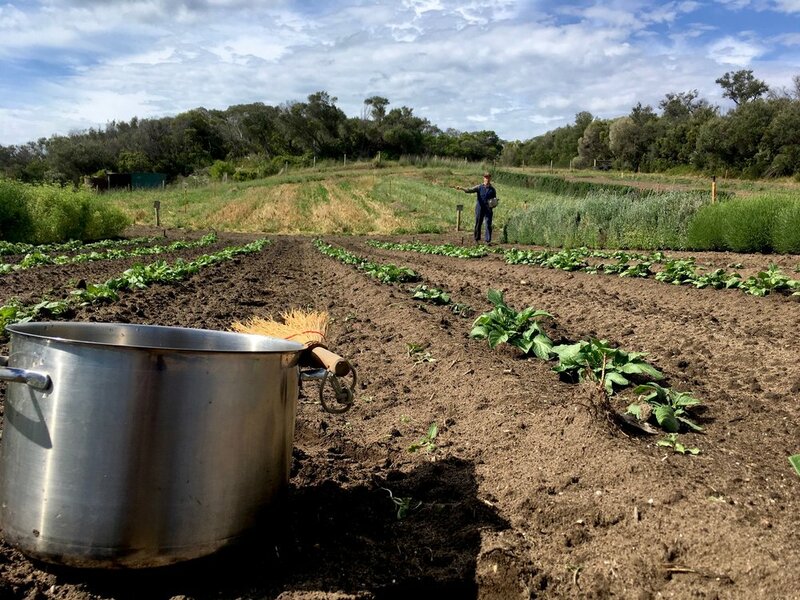 With Spring comes hope - with more small farms striving towards regenerative practices growing throughout Australia, we hope that more people can access clean local food. You can view a directory of CSA’s online and also there is a directory of farmers accredited markets. Know your farmer and support those who are nurturing our earth and our communities through their great growing practices! Wishing you all a wonderful growing season ahead!